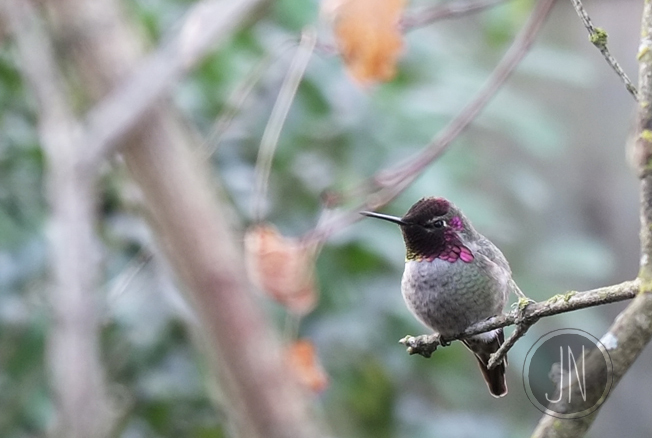 I’ve always liked the voices of hummingbirds. It’s this loud, squeaky call laced with so much attitude. But I didn’t really begin obsessing over the birds until temps dive-bombed below freezing. And suddenly I was worried. It’s COLD for those little guys. And, as they're not migrating, where in the world are they finding food in the winter?! Solution: I’d bring it to them. So I bought a feeder. And even kept the water from freezing by attaching a warmer. Hummingbirds came. And are AWESOME. I’m now stalking them. Crouching with my camera in the cold. Waiting for their zipping arrival. I’ve managed to identify three different individuals so far (all the while well aware this behavior screams GEEK). I’m probably only one mouse click away from buying a sticker that reads “I heart hummingbirds.” Indeed, I’m that cool.